Yesterday was Pandava Nirjala Ekadasi, the one day of the year where devotees of Krishna fast totally from everything, including water, for 24 hours. This fasting is done as an offering to Krishna, and also to receive the immense spiritual benefit that is bestowed upon the faster on this day. It was hard. I’ve only done it once before – last year, when I was on the bus tour, staying in Atlanta. Being surrounded by people who were also fasting made it easier to be determined. The sweltering heat made it much harder. I remember towards the end of the day, in desperation, I stood in a puddle of water that I found, hoping to absorb some moisture through my feet! Needless to say, that didn’t help much, but it did make me feel a little cooler. The next morning, the temple president, Vedasara prabhu, cooked a pre-mangal arati feast of lemonade and banana pancakes for all those who fasted – it was bliss! I led her around, showing her Srila Prabhupada’s belongings and the different rooms where he used to stay. Each new thing induced more and more awed delight. She then told me that as a young girl, in 1976, she’d come to the Manor and met Srila Prabhupada, but she had never been back. She felt that coming in to his rooms, she was both going back in time, as well as strongly experiencing the feeling of being in Srila Prabhupada’s presence again. It had an effect on me also. After she left, I went out onto the balcony to chant in the rays of sunshine, and I began to feel such a sense of gratitude for everything I have the privilege to experience here. I’ve been so fortunate to grow up here, in fact, fortunate doesn’t even describe it. To grow up in a Krishna conscious community, with loving friends and family; the freedom to worship whomever I desire; hearing the names of Krishna from birth – I have had a special introduction to life that cannot, and should not be wasted, or taken for granted. Later, I went downstairs to take part in the kirtan, led by Siksastakam prabhu and Gaur Gopal prabhu, both from Chowpatty temple in Mumbai. It was really an amazing evening. Many people were fasting, and the simple act of not having thought about eating and drinking all day seemed to make everyone chant with a focus that was tangible, and deepened the atmosphere of the kirtan incredibly. It was almost as if you could taste the holy name, in the absence of all other distraction. We carried on until midnight, people gradually leaving, until there were only a handful left. This morning, I really appreciated what Krishna meant when he said in the Bhagavad Gita ‘I am the taste of water’. To drink! To drink! Ahhh, the feeling cannot be measured. If anything, fasting makes you appreciate just the simple acts of eating and drinking that we completely take for granted. Each meal and drink is a blessing, I hope I never forget that. I’m leaving on Thursday and I still haven’t received my results for the past academic year. Not that I’m stressed out about it. I don’t think I’ve failed. But it would be nice to know, instead of being kept in suspense. Pretty much all of my coursework was speed-written after I came back from India and I really hope it didn’t show too much. Normally I can do things pretty well under last-minute pressure but they say pride comes before a fall right? This could be my moment! ‘Prabhupada is the greatest!’ my driver proclaims, as we take the Vrindavan turn-off, passing under a huge sandstone arch. The road is aptly named ‘Bhaktivedanta Swami Marg’. On the other side of the road, a snake of jazzily painted buses are parked, half leaning into the roadside ditch. People stream from them, following the gloved directions of guards, clad head to toe in pastel blue. They usher the crowds sternly into a nearby field, where a gigantic white canopy has been set up. ‘They are here to listen to a bhogi yogi,’ my driver shouts, as he brakes sharply. ‘And they believe him?’, I ask incredulously. My inner cynic tells me he’s hoping his comments will yield a healthy tip. I’m half right. If you want to read on, here’s the full piece: In Search of Heaven N.B. If you know Vrindavan well, some things in this may be a little inaccurate. I took a teensy bit of artistic licence. At the suggestion of my tutor, who gave me some feedback that the piece was too religiously sympathetic in places, I also tried to write in a more balanced (skeptical?) voice than I would, if I was writing for devotees. It’s an amalgam of two Vrindavan trips I’ve made in the past year, but the opening train ride comes from the most recent one. It was a fun one. Travelling with nine friends, we were almost doomed to the intense boredom that comes from booking seats on one of the slowest trains to Delhi there is. Luckily, we found ways to entertain ourselves, including: getting out all the instruments we had/could improvise – violin, flute, crisp packets, Tupperware containers, scrunchy pieces of paper and having a kirtan, much to the amusement of our fellow passengers. One of the passengers opposite got talking to us and I ended up talking to him for over two hours about our philosophy. I’m not used to preaching to people, and it was quite an interesting experience for me, finding out that I know more than I think I do. He was a really thoughtful person, but a bit misguided, and I went to bed that night wishing I had a book to give him. In the morning I was going to give him the address of the Delhi temple, or get his address to give him a book. I didn’t realise he was getting out at the station before us, and I hopelessly watched as I came out of the bathroom and saw him and his bags disappear out of the door. I came back to the cabin to find out that he’d given one of our group his number, but it turned out to be invalid. Oh well, I hope he felt inspired to find out more anyway. Wow, this post is not turning out as coherent as I’d hoped. I blame it on my Ayurvedic medicine, which is driving me crazy. Stinky herbs six times a day, does not a happy girl make. Anyway, what I had planned to say at this point is that, if you would like, you can also read the critique of this piece I had to write (including an annotated bibliography – which can be quite interesting, if I say so myself). Come to think of it, I think my results may be coming on Monday…fingers crossed. I consider myself so privileged to have so many extraordinary friends, and I just wanted to write a quickie to let everyone know about my friend Rasika’s new project. She’s been truly blessed with one of the sweetest voices I have ever heard, and is still unfailingly humble and devoted to using her talent in Krishna’s service. She recently finished recording a CD of beautiful kirtans and bhajans with the help of many other talented young kirtaniyas and I hope that you will find a way to get a copy, support her, and allow it to inspire you. Oh wait, here’s a way, fancy that! Don’t miss out. I was planning on just writing about my day today. It was a nice one. But then I thought, while I’m here, maybe I should go through the little ritual (which I suppose it is by now) of announcing that I am going away – YET AGAIN. Hm. These ‘I’m travelling-goodbye world-I’ll be back-just don’t bother emailing’ posts are getting kind of old. I’ve probably written about four in the last year or two. Oh well. Sorry, this is kind of another one. Yes I am going over to America for the third summer in a row, to join the Vaisnava Youth Bus Tour. Some of my greatest times in the past few years have been spent on the tour, and whilst I wasn’t planning on going this year whatsoever, it seemed to fall into my lap, and I realised, this may be my last chance to do it. I know, I know. People that know me tell me that I say that all the time, about everything. It’s half true, but I also feel it’s justified. My life after I graduate next year has yet to be fully planned – therefore I could be anywhere, doing anything. I also feel that this time in my life is one of great transition and growth. The experiences of the past few years have shaped me in previously unimaginable ways, and I am quite shocked sometimes to see how far I’ve come. Maybe it’s just a part of growing up, but at least in this lifetime, it’s a new feeling. 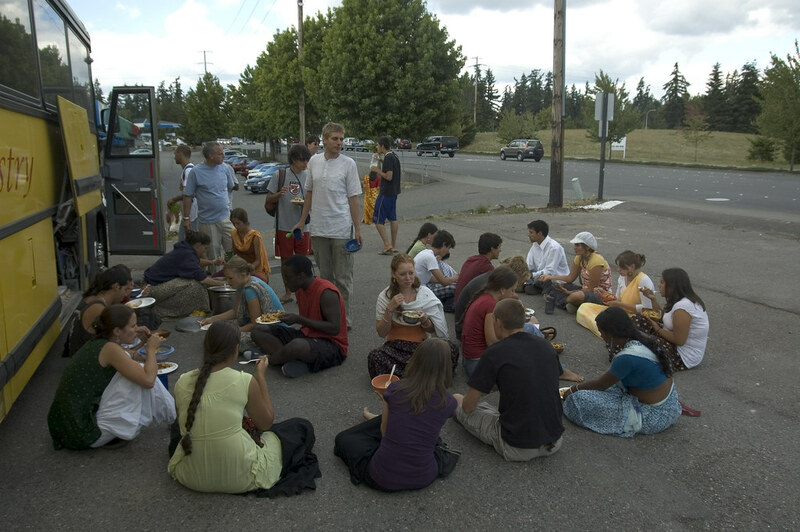 Stopping in a laundromat carpark to eat (quickly) before our performance in Seattle. Whilst I was on the full nine week tour last year, and seven weeks of the one before that, this year it will only be half – five weeks. Still, I’m not complaining. I’m incredibly lucky to be doing all of this and to be honest, I keep waiting for my luck to run out. I suppose that’s not a good way of looking at it, but I’m just trying to always remember that these good times are bound to be matched by bad times – all I can do right now is take full advantage of what I can learn and gain through these experiences. One of the most wonderful lessons I feel I learn and re-learn every time I travel with the tour, is the simple joy of serving Krishna and the devotees. Somehow it all falls into place so easily – getting up every day, helping at the temples we visit, whether it’s peeling potatoes at midnight, going out on harinam when it’s one of the last things we feel like doing (but doing it anyway), performing on stage at festivals, or even weeding temple grounds! Of course, there’s a natural pleasure to be found in each of these things, even when they are separated from Krishna. I for one, love peeling potatoes. I shall not elaborate on this for fear of appearing more strange than I do already, but you get my point. Peel party the night before Rathayatra in Montreal – bliss! Singing, dancing, making things clean, offering help to others – all of these things can in essence, some degree of satisfaction. However, put Krishna into the equation and these simple actions transform, becoming elevated far beyond their menial status. Performed together, we bond, experiencing greater pleasure from the shared goal of service, and in knowing that we are ultimately serving the most deserving, most appreciative person in the entire universe. 21 – SAT, Airport pickup in Jacksonville, Florida, by 6 p.m.
22 – SUN, Alachua. Loading the bus. Sunday Feast. Bus leaves after the feast. 23 – MON, Atlanta. Morning program. 24-hour kirtan crew returns from New Vrindavan and meets up with us. Intros & orientation. Performance Auditions. Rehearsals begin. 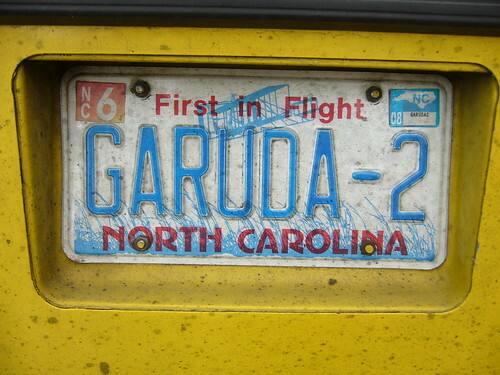 24 – TUE, Atlanta. Morning program. Performance rehearsals (kirtan, dance, drama, sound, lighting, make-up, stage props, stage hands… something for everyone.) Orientation continued, and group “getting to know you” games. 25 – WED, Prabhupada Village. Morning program. Rehearsals. Sports. Group games. 26 – THU, Prabhupada Village. Morning program. Rehearsals. Sports. Swimming. 27 – FRI, Prabhupada Village. Morning program. Drama rehearsals. Evening premiere performance in Winston-Salem. 28 – SAT, Detroit Ratha-yatra. 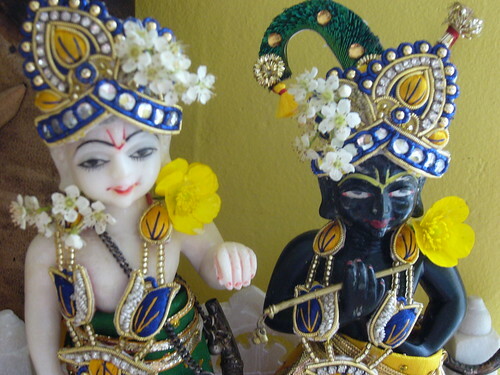 30 – MON, New Vrindavana. Morning program. Rehearsals. Prabhupada’s Palace of Gold and Organic Gardens tour. 01 – TUE, Gita Nagari. Temple Makeover. 02 – WED, Gita Nagari. Temple Makeover. 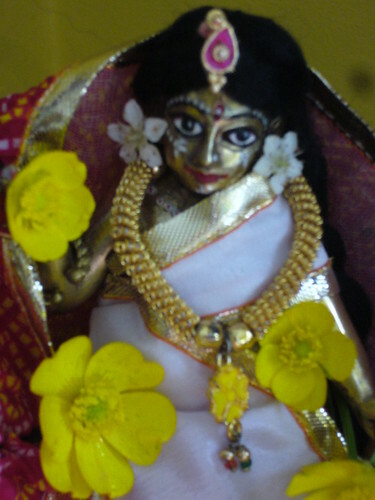 03 – THU, Gita Nagari. Gundica Marjana. 04 – FRI, Washington D.C. Ratha-yatra. 05 – SAT, New York City. 26 2nd Ave & Tompkins Square Park. Evening theater program at Edison, NJ. Evening theater program at Towaco, NJ. 07 – MON, Maine. Adventure Bound. Whitewater Rafting. 09 – WED, Halifax, Nova Scotia. Performance at Neptune Theatre. 10 – THU, Drive to Montreal. Swimming pool in Quebec city. 11 – FRI, Montreal. Ratha-yatra preparations. Evening Harinama. 12 – SAT, Montreal Ratha-yatra parade and festival. 13 – SUN, Montreal Ratha-yatra. Day two of festival. 14 – MON, Montreal. Maha clean-up Dhama Seva. Olympic Pool Swimming. 15 – TUE, Ottawa. Bungee jumping / zip lining (see bungee.ca). Evening theater performance in Ottawa. 16 – WED, Toronto. Evening outdoor festival program at Yonge & Dundas square, downtown Toronto. 17 – THU, Niagara Falls – Maid of the Mist boat ride up to the water falls. 18 – FRI, Toronto. Ratha-yatra preparations. Evening Harinama. 19 – SAT, Toronto Ratha-yatra parade and festival. 20 – SUN, Toronto Ratha-yatra festival, day two. 21 – MON, Serpent River, Ontario. Swimming, rest and relaxation. 22 – TUE, Thunder Bay, Ontario. Performance at Lakehead University. 23 – WED, Drive across the Midwest to the Rocky Mountains. 24 – THU, Royal Gorge, Colorado. Whitewater Rafting. Late afternoon at Great Sand Dunes National Park. 25 – FRI, Spanish Fork, Utah. Evening program at temple. 26 – SAT, San Francisco. Ratha-yatra preparations. 27 – SUN, San Francisco Ratha-yatra in Golden Gate Park. 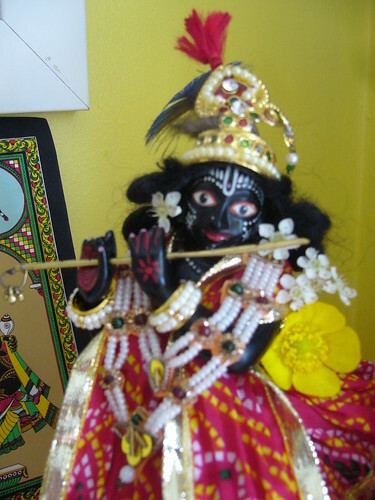 I’ve been contributing to a group blog called SimplyKrishna. It’s still in its baby stages and we’re finding our way with it, but the general idea is to have different contributors, united in our interest in Krishna consciousness, just posting about our lives. It’s preaching, but not in a forceful way – we’re hoping that people that see it will get some kind of picture, first of all of the diversity of Krishna devotees, but also of their normality and accessibility. It’s currently being written by myself and my friends Rishi, a medical student and Gateen, who is currently a member of the ashram at Bhaktivedanta Manor. 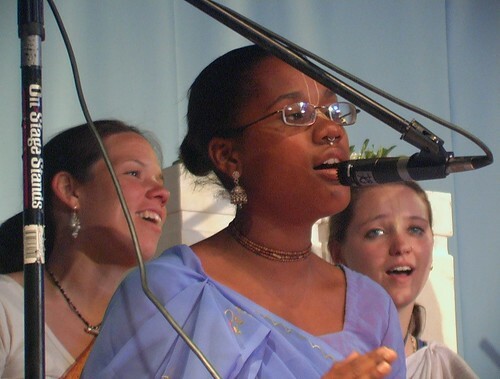 We’re soon to be joined by Beatrice, who has recently come to Krishna Consciousness and is also a medical student. See what you think. And remember, if you’re reading this blog, most likely you’re not the target audience for SimplyKrishna. So be nice. I took a nap today. Well, I didn’t so much take it as fall into it. The Ayurvedic medicine I’m taking is making me feel quite strange at times. The other day, some special ‘Ayurvedic chocolate’ (as my doctor put it) was added to my regime – basically four black cubes of something that clears the roads downtown if you catch my drift. Yep, too much information. Sometimes I feel like I’m not allowed to write here unless I have a topic, or a theme, or some exciting, dramatic news to broadcast. Then I remember that this is my blog and I can write what I want – however self involved that sounds (it pretty much is). It’s funny actually, though I try and make this blog very readable and interesting, most of the time I’m quite unaware of who actually reads it, aside from the occasional comment I get out of the blue. The other day someone told me they read this blog regularly and I was genuinely surprised (you know who you are). Anyway, my purpose in writing right now is that I want to. It’s 10:20pm and I should be going to sleep. I’m getting up early tomorrow to pick tulasi manjaris at the temple. I did it for that first time last week and I really felt so privileged to be able to offer some service to Vrinda devi. Perhaps it’s psychological but even after doing it only once, I’ve felt my japa improve and my affection and understanding for the role that Vrinda devi has to play in the devotional progress of every devotee increase. I seem to have the conversation regularly with people about how it is growing up as a gurukuli, being comfortable and reasonably aware of all the of the main philosophical concepts, stories from the Bhagavata Purana (thankyou Amar Chitra Katha) and incarnations of Krishna/demigods, but feeling like that knowledge is quite shallow, or riddled with holes. I feel there’s a real weakness in many in my generation, in that we have yet to really go much deeper into the philosophy and often don’t receive much encouragement to. Of course some have a greatly different experience, and I would guess that many younger than me may not even think that this is an issue yet. I don’t know, I just feel something has to change at some point. I speak wholly for myself too, I hasten to add. I am by no means learned or detached, but I do feel that I am becoming more and more desparate to change that. Maybe desperate isn’t the right word. After all, if I really wanted it that much, surely I would jump out of bed in the morning, run downstairs and devour the stacks of Srila Prabhupada’s books stacked two rows deep. But I feel intimidated. I feel acutely aware of my lack of understanding; my naivete, and just how easy it would be for me to get the wrong idea. I feel like my enthusiasm is so fragile, like a freshly blown bubble, ready to be popped at any second by an eager hand or a wayward gust of wind. Still, what to do. I can only pray that in this lifetime I am going to elevate myself beyond whatever small progress I have made in the past. I am still barely even at the beginning. Uh oh. Almost 11. I suppose I should stop writing now. Hands up, who used to hold buttercups under their chin to check if they liked butter?